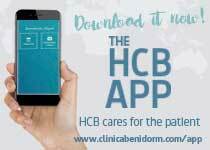 The Unit of Haemodialysis and Holiday Dialysis of the Hospital Clínica Benidorm forms a part of the Nephrology Service of the Hospital Clínica Benidorm (HCB) and is integrated in their hospital installations, located in the centre of Benidorm, in the heart of the Costa Blanca (Spain). The Unit of Haemodialysis and Holiday Dialysis HCB offers patients who are in dialysis treatment, exclusive installations equipped with the most advanced technology and supported by the index of services which the hospital offers of more than 40 medical specialties in outpatient, hospitalisation, emergencies and the Intensive Care Unit. 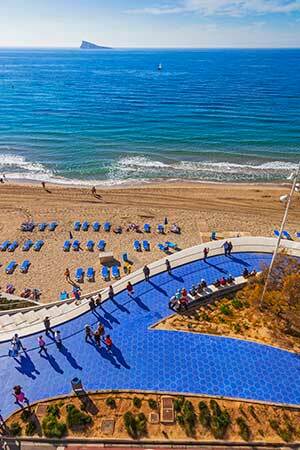 The work of the Unit of Haemodialysis and Holiday Dialysis of HCB is directed to national patients and foreign residents of the area, long term residents and especially, those who wish to spend their holidays on the Costa Blanca. 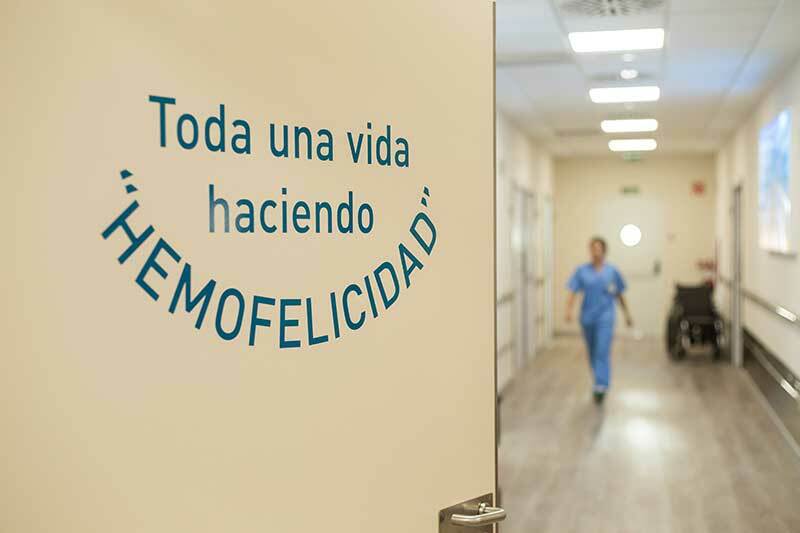 The Unit of Haemodialysis and Holiday Dialysis continues the model of attention to the International Patient of Hospital Clínica Benidorm, based on a team of medical professionals, administration and multilingual international interpreters who help the patients and their companions to feel like they do in their home country. The team adapts to the needs of the patients so that they receive a good dialysis treatment, respecting the prescriptions of their proceeding centres and this way achieving that their holidays and their dialysis in Benidorm, be as complete as possible. 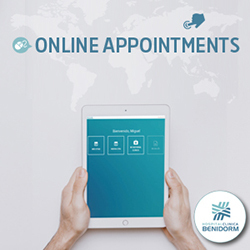 Because of this, the dialysis sessions are organised with the patient in collaboration with the most important travel agencies in Benidorm. 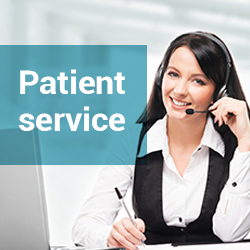 Help is offered towards the organisation of the stay of the patient and their companions and the planning of leisure activities and entertainment. The medical report and the prescribed haemodialysis of the patient are studied and adapted to achieve the best possible Haemodialysis session. 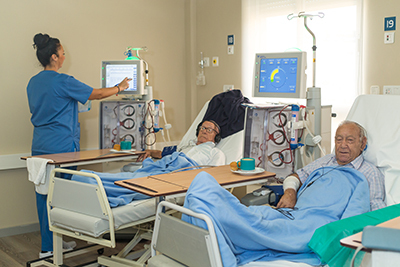 The quality of the dialysis liquid obtains ultrapura (maximum possible quality), recommended by the Spanish Nephrology Society and other international societies for all of the modalities of haemodialysis. The Unit is solvent in the management of complications thanks to their experience, the hospital resources available to them and the uninterrupted treatment. The Unit manages the complications derived from the vascular access points, within the centre. The level of quality of service has allowed it to become the centre which is associated with the Public Health Service for the Dialysis service of the area. Collaboration with ALCER and other renal illness associations. Collaboration agreement with AVIBE (Association of Travel Agencies of Benidorm) and with the Visit Benidorm Foundation. Availability for nocturnal dialysis from 22:00 to 02:00 (only in groups of 5 or more people). Special Services for patients with infectious pathologies. Interpreter service in various languages. Acclimatized area with electric articular chairs, television with multiple channels in various languages, audio through headphones for the TV, radio etc. Specialised Medical and nursing staff. Refreshments during the session and when it ends. Request all the information you need to get to know our service or if you need help to reserve a place, complete this form and we will contact you. If you wish to start the RESERVATION now, read the instructions and the regulations. I accept that you may use my contact details for the reception of electronic communications from CENTRO MÉDICO SALUS BALEARES SL for publicity purposes (news and health promotions of HCB).